The quick feet test provides information on the presence of fast-twitch muscle fibre in the muscles involved in sprinting and indicates your potential to execute quick movements. Hereditary factors such as limb length, muscle attachments, and proportion of fast-twitch fibres do place a limit on one’s maximum potential, but we can improve our speed and quickness with proper training. Record the better of two trials. Analysis of the result is by comparing it with the results of previous tests. It is expected that, with appropriate training between each test, the analysis would indicate an improvement in the athlete’s foot speed. 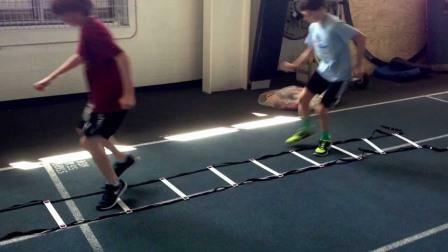 Speed through a ladder can indicate much about an athlete’s quickness. A time of less than 2.8 seconds for males and 3.4 seconds for females for running the length of a 20 rung ladder, one foot in each rung at a time, is considered as excellent for college athletes. This test is suitable for active athlete but not for individuals where the test would be contraindicated. There are published tables to relate results to a potential level of fitness and the correlation is high.